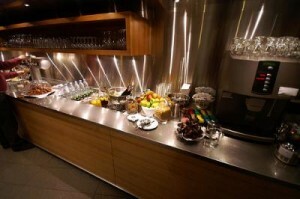 Nothing Ho-Hum About Lufthansa’s New $10 million lounge at J.F.K. Dude-can you believe that this is an AIRPORT LOUNGE? Even though everyone else is cutting back, Lufthansa’s glamour makeover is The Bomb. It’s 16,000 square foot triple-decker glass-walled space (one for each flight class) has three buffets, showers, a bar ( w/ real bartenders) and wi-fi everywhere. Dining options include a large buffet of international antipasti, fresh salads or finger sandwiches, as well as regional, Mediterranean and Asian a la carte dishes such as steamed Chinese dim sum, Indian curries, and Tom Ka Gai Thai soup with coconut milk. Save room for one of several delectable desserts, including Mousse au Chocolat and DEMEL’s Apple Strudel. Almost has you rooting for a plane delay.